How can I get information if my HD format is case sensitive or case insensitive? I want to make sure my Mac running Mountain Lion has a case sensitive file system. If the file system is case sensitive, you will see Case-sensitive Journaled HFS in the first pasted line and Mac OS Extended (Case-sensitive, Journaled) in the third. Disk Utility will also show you this from the info window for any File System it can see. run diskutil info <device> and your answer will be shown. File System Personality will reflect one of the known personalities. If you see: File System Personality: Journaled HFS+ that means it's case insensitive. To answer your question, you want to see File System Personality: Case-sensitive Journaled HFS+. Update for El Capitan, see the attached screen shot from Disk Utility's Info-window. UPDATE: As some people have noted, the answer I proposed below is flawed. @John however has a similar answer without the flaw. If the ls command displays both files, abc1 and ABC2, then your drive is case insensitive (i.e. case does not matter). If only abc1 is displayed, then it is case sensitive (i.e. case does matter). Before you close Terminal, enter rm abc1 and rm ABC2 to clean up after the test. You can also use Disk Utility to check the partition format. If the format is case-sensitive, it will say so in the format name, otherwise nothing will be indicated. 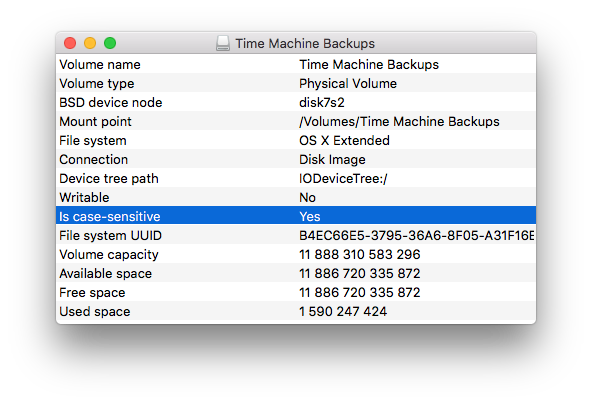 Beware that it is not the "Mac" that is case-sensitive or not, it is each partition on your drives. Not the answer you're looking for? Browse other questions tagged macos mountain-lion hard-drive . Convert case-sensitive HDD to journaled insensitive?